State licensed and nationally certified staff have highly specialized training in cognitive and vision rehab and often work in conjunction with a neuro-optometrist. ​The Inpatient Occupational Therapy program at SLRC is dedicated to promoting life long health and well-being through engagement in "Activities of Daily Living". Activities of Daily Living include leisure, work, self care, and home management. 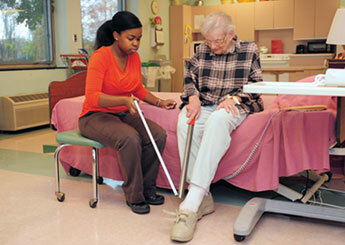 Our staff works with a variety of adults with different medical conditions. These conditions may be orthopedic, neurological, cognitive, and/or visual deficits. Patients are provided with meaningful activities such as self care tasks, homemaking or other occupations where the patients learn new strategies, techniques or adaptations to achieve maximal independence. For continued care, some patients may benefit from outpatient services.